Johannes Vermeer (1632–75) is arguably the best-known Dutch artist of the 17th century, but you would be forgiven for recalling his iconic Girl with a Pearl Earring (c. 1665) before his musical scenes. 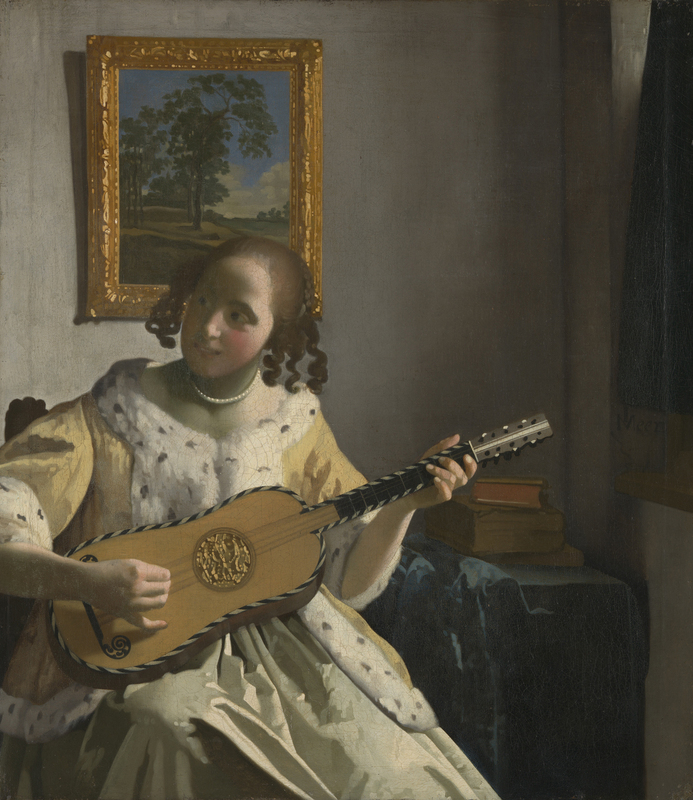 Five of the latter – including one from the Royal Collection – have been brought together at the National Gallery, accompanied by a number of works by Vermeer’s contemporaries, to create an exhibition that explores the intimate link between music and painting (until 8 September). Intimacy is indeed a striking aspect of the exhibition; spaces are small, walls are dark and lighting subtle, allowing the works’ own radiance to take centre stage. Music played a pivotal role in the leisure and pleasure of all classes in the 17th century. It brought groups together in festivity, provided lovers with a romantic language and offered solace and private meditation to an individual. All three of these roles are depicted by the paintings. With the exception of The Music Lesson (c. 1662­–63), however, Vermeer’s works all show young women playing solo. Elegant but mysterious, they command our attention with their gazes while retaining just enough reserve to make us feel we have interrupted. The accompanying works have been well chosen. Jan Miense Molenaer’s image of a young man and woman playing a theorbo and cittern (c. 1630–32) is delightfully like a Vermeer with its whimsical details: the shoe, the dinner plate and the little dog. But if these are purely additions from the artist’s imagination, the depictions of the instruments themselves are startlingly accurate. Seven period instruments are on display in the exhibition, including a guitar that could almost be that played by Vermeer’s Guitar Player (c. 1672) herself. It is also remarkable to note how closely music was linked with social class at the time. The exquisite, hand-painted octave virginal is described as a ‘plaything’ for upper-class ladies, and would have stood first and foremost as a symbol of their wealth and position in society. If the sitter were not a musician, an instrument in their portrait would be nonetheless appropriate, alluding to their elegance and sophistication. This was true for both men and women; in fact, it was desirable only to dabble in music, rather than be seen to be a virtuoso – such characters had doubtful reputations! Divided into four themed rooms, the exhibition is balanced, with an effective combination of small-scale and larger works and elaborate frames. In a further fifth space, visitors can examine vastly magnified sections of the five paintings which reveal clues to the artist’s methods, as well as traces that he inadvertently left behind, such as brush bristles and fingerprints. Fascinating though this is, the works in question are not reproduced alongside the magnified sections, and an image of them in the mind is not quite enough to appreciate the details being highlighted. The musical ‘backdrop’ to the paintings, however, is a very special and successful addition. The Gallery has collaborated with performers from the Academy of Ancient Music, who perform live recitals with the intention of transporting the visitor back to the 17th century and bringing the paintings to life. A particularly authentic sound is achieved through the use of original instruments. The harpsichord, for instance, is a copy of an Italian instrument dating from 1610. Even some playing techniques specifically derive from Vermeer’s day; rather than resting it under the chin, the violinist holds the instrument against his ribcage. The ability to sit so close to the players – recreating the intimacy of 17th-century gatherings in the private home – further enhances the authentic feel of their performances. The exhibition will certainly entrance music and art lovers alike. ‘Vermeer and Music: The Art of Love and Leisure’ is on at the National Gallery, London until 8 September. Can a timeless Constable painting hold its own on a busy train platform?